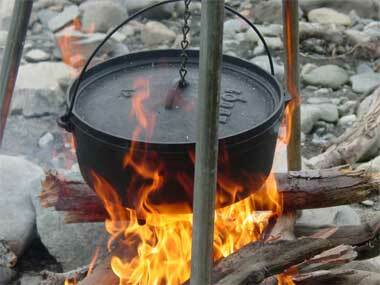 Dutch oven on campfire; photo by Jason Slemons (used by permission). Cast iron pots were among the most cherished possessions of explorers, mountain men, settlers going west, and the cattle drive cowboys. Chuck wagon cooks used two or three Dutch ovens when preparing chow (the chuck wagon was also recognized in 2005 as the official state vehicle of Texas). Dutch ovens are used for baking, roasting, boiling, braising, frying, simmering, steaming, and other campfire cooking methods to make dishes such as biscuits, cornbread, appetizers, entrees and desserts. Modern campers are still using the durable and flexible Dutch oven (the Dutch oven is also the state cooking pot of Utah and the state cooking vessel of Arkansas). Americans still gather around campfires after a meal from the same kind of Dutch ovens used by our pioneer forbears and tell stories of our history and ancestors. RESOLVED, That the 79th Legislature of the State of Texas hereby designate the cast iron Dutch oven as the official State Cooking Implement. 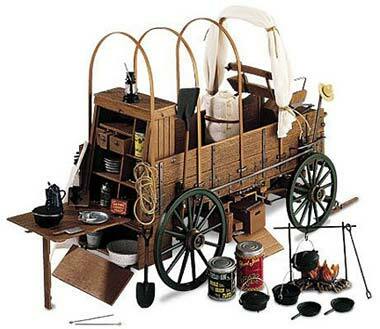 Model of a chuck wagon with Dutch ovens; photo © The Franklin Mint (all rights reserved; used by permission).